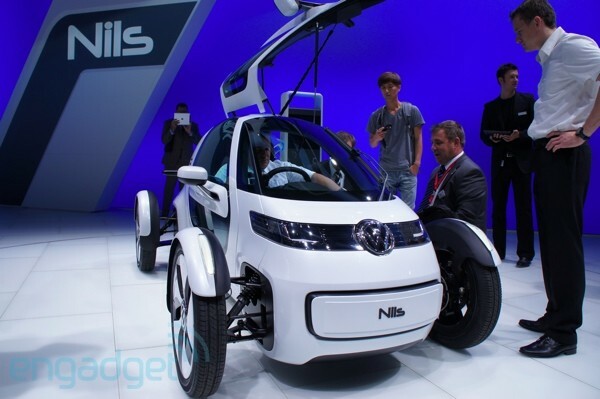 Audi isn't the only one with a tiny little EV with exposed wheels at Frankfurt this year. Parent company Volkswagen has one too, but this is even smaller. It's called the Nils and it's designed for commuters in the "world of tomorrow" -- commuters who will be very thin and, apparently, short. Big people just don't fit well into this tiny thing, but if you're of modest size or below this could be an interesting little ride. It has only 34-horsepower (25kW) available from a rear-mounted electric motor, but since it weighs just 1,000-pounds (460kg) that should make for some peppy commutes -- of less than 40 miles (65 kilometers), which is the maximum range here. More details after the break.